We lived with my Granddad James Bridge until he died in 1957 when I was 8. I remember him as often grumpy and not to be disturbed when sleeping in his chair. I knew he'd been injured but only found out the details from the National Archive WW1 Records when they went online and I found his war records. The Regimental Museum at Warwick also filled in more detail of his war experiences from the Officers' War Diaries. He attested in December 1915 and was called up in June 1916. He was 36, married with 3 children (the youngest being my mother Rose) and worked as a Gamekeeper in Hope-under-Dinmore, Herefordshire. He had left home to work at age 12. He joined the Kings Shropshire Light Infantry No 24859 and was posted to France in October 1916. He was transferred to the 11th Battalion Royal Warwickshire Regiment No 27850. This was towards the end of the Battle of the Somme. On 20 November 1916 in the Hamel area, he suffered shrapnel wounds to his thigh and buttock. He was taken by Field Ambulance 48 to Casualty Clearing Station 4, then to the Canadian General Hospital at Le Treport. He was shipped back on 3 December to the Military Hospital Tranmere, Birkenhead where he spent 55 days recovering from his injuries. 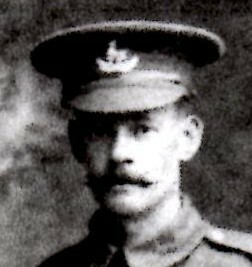 In April 1917, he was sent back out to France and joined the 16th Battalion Royal Warwickshire Regiment. In June/July he had several bouts of gastro-enteritis and was sent back to spend 23 days in the Red Cross Hospital, Christchurch with "colitis". 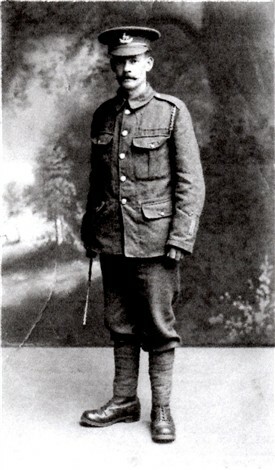 Once recovered, he returned to France in September 1917 and was transferred to the 1/6th Battalion Royal Warwickshire. The Third Battle of Ypres was just beginning with an attack on the Menin Road Bridge. In November 1917 as part of the 48th Division, the Regiment moved to Italy where life in the Italian trenches was quieter for several months. From March to October 1918 his battalion took part in the fighting at Montello, Asiago, Ambrosini. After the Armistice they stayed in Valdagno until March 1919 when they returned to England. He probably got his liking for Gorgonzola cheese from being in Italy. Granddad was then aged 39. His discharge papers state: Military Qualifications — "First Class Musketry", and Special remarks — "Good soldier, trustworthy and good character". His injuries, illness and spells in hospital must have been horrible but perhaps they helped to save him from being killed in battle. This page was added by Bob Stephen on 24/07/2018.